Aerial silks is an amazing workout for your core and upper body. It can be a great cross-training exercise for rock climbers and gymnasts. Cori started instructing Aerial Silks when her daughters were old enough to be interested in it. 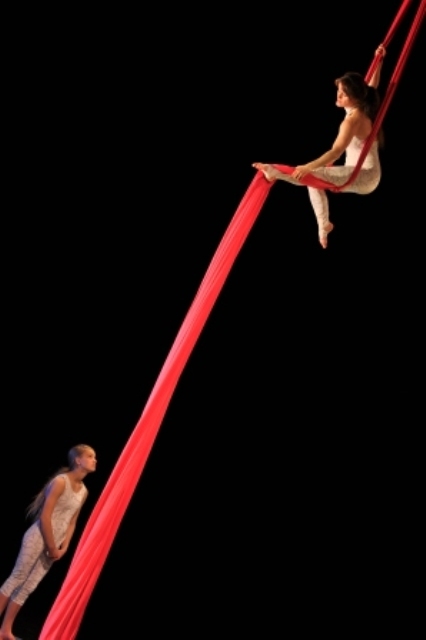 She developed and implemented the unique aerial silks program which was adopted by the The Vancouver Circus School. If you are interested in offering aerial silks classes through your gymnastics program, or to find out coach's training in aerial silks, you can start by purchasing the Aerial Silks Instructor's Manual and DVD for Beginners at The Circus Aerials Society. Cori started coaching gymnastics when she was 16. She is certified by the Canada's National Coaching Certification Program (NCCP) as a Level 2 Gymnastics Coach and a Level 2 Trampoline Coach. She has been training in gymnastics for many years. Circus enthusiasts and performers come from many backgrounds. Some have been dancer, some gymnasts or acrobats and some have never done anything like this before. Circus arts take hard work and dedication but what you do now is more important that what you did in the past.